MAM Starter Cup, 5 oz. Designed for the first step to independent drinking, the MAM Starter Cup includes a spill-free extra soft spout. 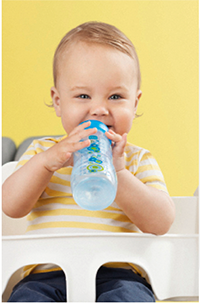 The ergonomic shape and the non-slip handles are perfect for little hands. All MAM cup parts are interchangeable. Clean before first and every use. Before first use separate all parts and place them in boiling water for 5 minutes. This is to ensure hygiene. Check all components before each use and throw away at the first signs of damage or weakness. To ensure proper cleaning/sterilizing all bottle parts MUST be disassembled. Cleaning/sterilizing while assembled can damage the bottle. Dishwasher safe in top rack (149 ° F / 65 ° C) but food colorings may discolor components. Do not use abrasive cleaning agents. Only soft bristle brushes or soft sponges should be used. Hard scourers may scratch the plastic. Sterilize using one of the following methods: steam sterilizing (electric or microwave according to manufacturers instructions), boiling in water for at least 5 minutes or liquid sterilizing solution. After boiling or sterilizing allow all parts to cool. 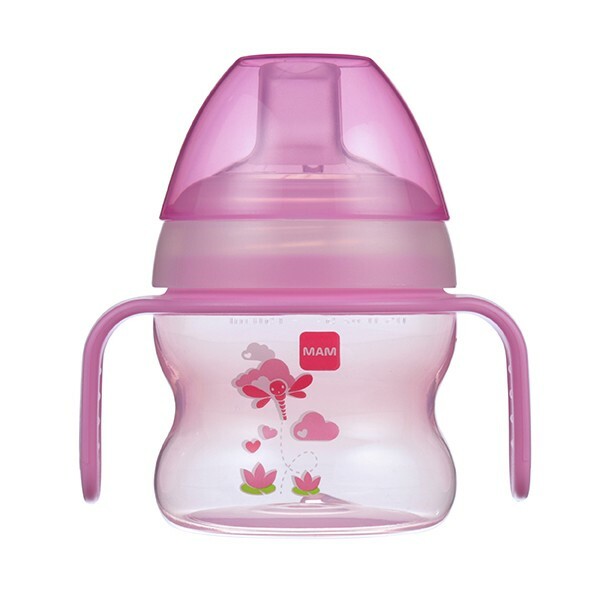 MAM Starter Cup, 5 oz. is rated 4.8 out of 5 by 16. Rated 5 out of 5 by JG88 from Love it! 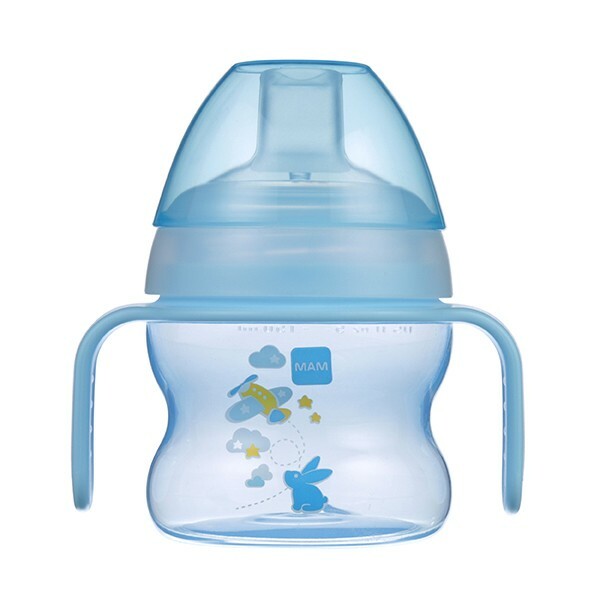 Mam pacis and bottles were the only kind our daughter would take so when it came time to start drinking from a sippy cup we wanted to go with Mam as well. She loves the cup and had no issue figuring out how to drink from it. The handles make it easy for her to hold on her own. As with the other Mam products we've used, we love it! 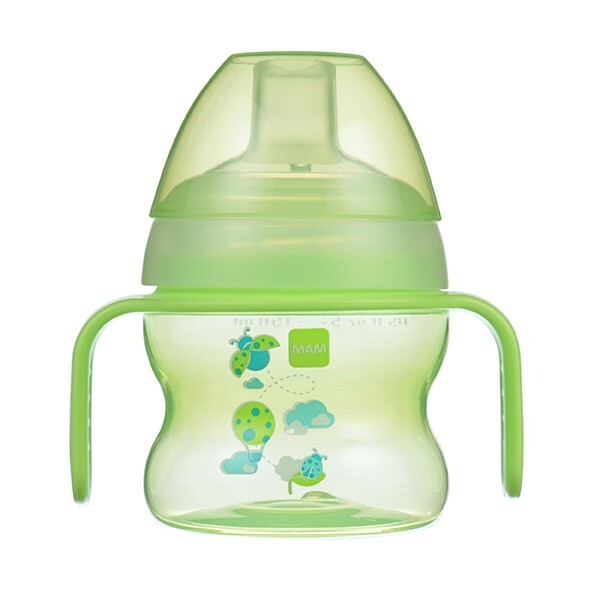 Rated 5 out of 5 by Bunni52 from Best Sippy Cup My son has the blue one and the green one. They're easy for me to clean, easy for him to hold, and cute. Conveniently, it fits the breast pump I have, though I'm sure it won't be like that for everyone. The mouth piece is soft, and easy for my son to drink from. These sippy cups are great for learning to use a cup.